Loyal readers may perhaps be growing tired of reviews on vigilante cop movies. I have at this point seen so many films of that formula that I’m beginning to completely ignore their political implications and simply accept that “vigilante policework” is just an excuse to setup a series of action sequences and one-liners. In COBRA only one scene pays much heed to the ramifications of police officer ignoring “procedure” and simply blasting away at criminals. 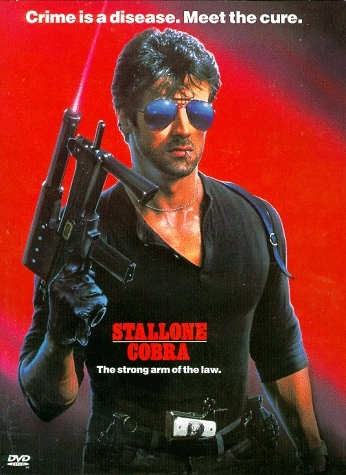 Unfortunately, the scene is so lopsided in favor of the cop—in this case Sylvester Stallone as “Cobra”—that it makes no sense. After saving several witnesses from a homicidal maniac in a grocery store by gunning down the crook, Cobra is accosted by a news reporter whining about criminal rights. Sorry, but even a soggy liberal like myself can accept that if the bad guys bring shotguns into the equation, the cops are sure as heck allowed to bring guns of their own. The rest of COBRA is just as stupid, though at times enjoyably so. The central plot concerns Cobra tracking down a serial killer. This “investigation” is punctuated by several bizarre murder scenes in which pretty young women are stabbed in slow motion by said serial killer. We learn that in fact there is not just one individual behind these gruesome acts, but several who travel via Astrovan, wield axes, and happily murder their victims in public places in plain sight—parking lots, underpasses, etc. Despite this, the police haven’t even realized there are more than one killer. Eventually a witness (Brigitte Nielsen) stumbles across one of the murders in progress. The killers note her license plate and proceed to track her down. But get this, the dumb woman hasn’t even realized she’s witnessed a murder! The rest of the movie is about the thugs trying to find the woman (Cobra of course comes to her defense) even though she didn’t realize she had witnessed a crime! That really makes the plot feel… necessary? By film’s end the band of killer has grown into a veritable army equipped not just with Astrovans, but motorcycles too! How exactly do serial killers organize? Is there a recruiting center or something? Supposedly the thugs are all about creating a “New World Order”… whatever that means. I guess these were the people the Beatles were talking about when they said “You say you wanna a revolution, well you know, we all want to change the world… but if you talk about destruction, you can count me out.” Good things the Beatles had broken up by the 1980s. This all builds to a showdown between Cobra and the bad guys. There’s lots of shooting and motorcycle crashing. In one hilarious bit of continuity-ish-ness Cobra and the witness flee through an orange grove into an adjacent factory. Now, logically one would assume this factory is some kind of orange processing plant (?) but if so, it is the most unsafe orange processing plant ever. There are open flames everywhere. Flammable gas lines are run directly under walkways such that, with the turn of a knob, an unwitting passerby can instantly be set ablaze. Oh, and did I mention the meathooks that zing through the main floor of the factory? I mean seriously, OSHA would have condemned the place in an instant! COBRA is about as dumb as movies get. Dare to be stupid.